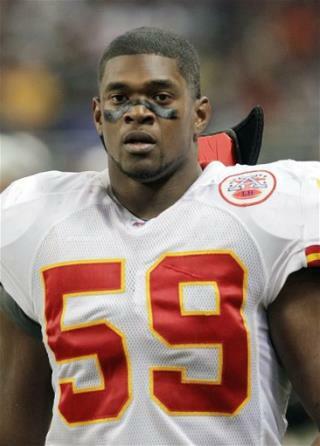 (Newser) – Former Kansas City Chiefs' linebacker Jovan Belcher's body has been exhumed more than a year after he killed his girlfriend and himself so that his brain can be examined for signs of a degenerative condition linked to repeated concussions. An examination of Belcher's brain could determine whether he had chronic traumatic encephalopathy last December when he killed his girlfriend Kasandra Perkins, with whom he had an infant daughter, in their home. Belcher then drove to the Chiefs' practice facility and shot himself in the head in the parking lot. Dig him up and Jerry Jones will sign him to a contract. I've got an idea. Let's sue somebody.